Some races immediately enter the history books as the flag falls. The 2017 Austrian GP proves one such example, as Andrea Dovizioso (Ducati Team) and Marc Marquez (Repsol Honda Team) staged a showcase of the best of the sport, right down to the wire. Almost side-by-side over the line, it was ‘DesmoDovi’ who took his third win of the year – with Marquez just keeping it on track for second in signature style. Dani Pedrosa (Repsol Honda Team) completed the podium, coming back from a Q1 hurdle on Saturday to make big points gains in the standings. Polesitter Marquez took the holeshot, before a stunning move from Jorge Lorenzo (Ducati Team) saw him cut inside second-placed Dovizioso and then take Marquez on the exit – an incredible second ahead over the line at the end of Lap 1. Marquez slotted into second as Dovizioso threatened, with Valentino Rossi (Movistar Yamaha MotoGP) a big mover – into fourth past teammate Maverick Viñales (Movistar Yamaha MotoGP). Back in the battle, Viñales had run wide into Turn 1 to lose some ground and come back on track from the run off, with Lorenzo at the head of the race then being reeled in by Marquez. Soon, Marquez was the man to misjudge an apex – Turn 3 – with Dovizioso quickly pouncing to take over in second. Meanwhile, Johann Zarco (Monster Yamaha Tech 3) had moved up to tag onto the front four, with Pedrosa the next man to join the party – making a train of five behind Lorenzo in the lead. Marquez then struck back against Dovizioso, with 18 laps to go and everything still in the air. At the front, Marquez and Dovizioso had begun to pull away, and everything settled into what felt increasingly like the calm before the storm – and was proved exactly that. After the NeroGiardini Motorrad Grand Prix von Österreich, Marquez remains ahead on the road to Silverstone, but it’s now Dovizioso hot on his tail – 16 points adrift. Viñales, after Austria, moves out the top two in the Championship for the first time this season – and Pedrosa is now within two points of Rossi. One of the duels of the century was a first time affair: Andrea Dovizioso (Ducati Team) vs Marc Marquez (Repsol Honda Team) at the Red Bull Ring, with the duo fighting it out over the last lap. Going down to the final corner and a classic last lap lunge, the Italian emerged ahead over the line and in doing so took his third win of the year. He also moved back up in the standings to second – behind only Marquez. 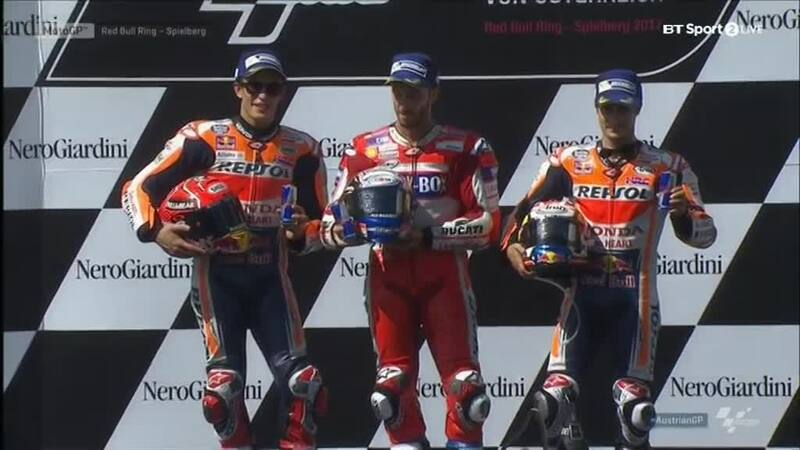 Andrea Dovizioso, P1: “Marc always tries to do something on the last lap! It was difficult for me because I lost a lot in the two left corners, and it was easy for him to overtake me – I didn’t know he wasn’t close and I closed the door, so he had chance to catch me again. He had a chance in the last two corners, but the penultimate corner I braked very, very late and it was difficult for him. I didn’t expect him in the final corner, because there is no space, it’s not a braking zone. But I heard his engine the corner before the last, he opened the gas before me, and I knew he wanted to try. So I left the door open because if I didn’t he would have hit me and could have won. He was good stopping the bike and trying to exit, but I was faster. When asked about his form in 2017, the rider from Forli said the answer is simple: small improvements contributing to a big difference. This time, the risk neither paid off nor backfired, leaving Marquez with another trophy and a nice round 20 points to put in the bank – with two key title rivals off the podium, too. His lead is now 16 points.